Welcome aboard. Now let’s find our way around the boat… The front, or forward of the boat is called the bow. The back of the boat, or aft, is the stern. Forward and aft are also directions. Meaning anything between you and the bow is forward of you and anything between you and the stern is aft of you. Got it? The area around and forward of the steering wheel, or tiller, and where the crew drives the boat from is called the cockpit. The right side of the boat when you are facing forward is the starboard side. You can see this in my painting above. The left side is the port side. If you are to move the boat backwards, it is to go astern. Port and starboard are also used to describe directions off the boat. Anything sighted at roughly a right angle to the boats center line is abeam. Anything aft of the beam, if not directly astern will be off the port or starboard quarter. Windward and leeward are also used to specify directions. They relate to wind direction. Windward means towards the wind. The side of the boat the wind is blowing is windward. Leeward means away from the wind, the downwind side. If one is aware of the winds, as any sailor should be, you will know where the wind is coming from. 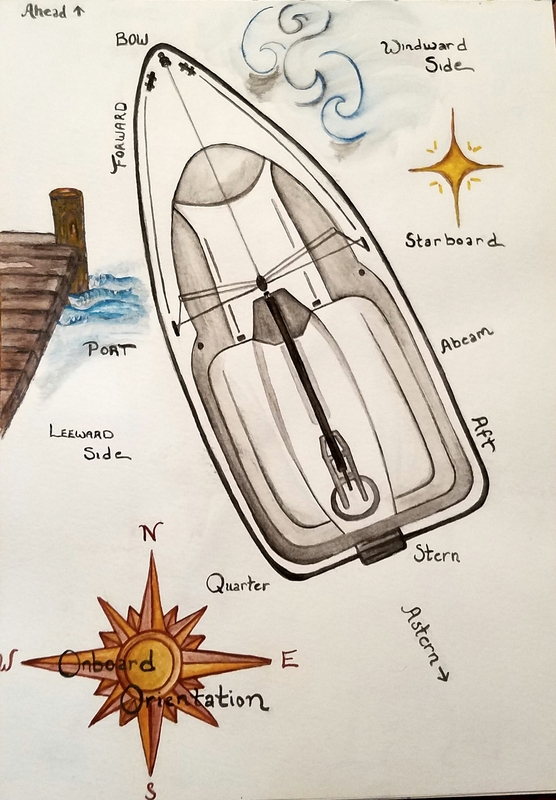 Hopefully this will also help you to know your place on the boat, as well where to look and go. Land ho! Off the windward bow! Do you know?